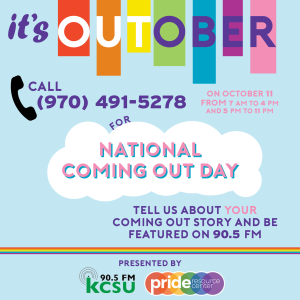 FORT COLLINS (October 5, 2018) – KCSU and the Colorado State University Pride Center are celebrating National Coming Out Day on Thursday, October 11, 2018. To raise awareness, KCSU will be tabling in CSU’s plaza outside of the Lory Student Center, playing LGBTQ artists all day to celebrate the community and diverse identities of the CSU student body. Students are invited to come down to the KCSU studio in the lower level of the Lory Student Center to come out on-air and share their story. KCSU is giving local community members the chance to call-in and share their story from the hours of 7:00 a.m. to 4:00 p.m. then again from 5:00 p.m. to 11:00 p.m. The phone number for KCSU is 970-491-5278. Callers can expect a live DJ to answer their call off the air and then put them on-air live to share their story or simply just come out and be a part of the celebration of National Coming Out Day. At this event, KCSU will also be celebrating the Pride Center’s 20th year of operation and remembering the 20th anniversary of Matthew Shepard’s passing. Shepard, a young gay man, was beaten to death and left for dead in Laramie, Wyoming on a big wooden fence for 18 hours by two men who didn’t agree with Shepard’s sexuallity and advocacy. Shepard was transported to Poudre Valley Hospital in Fort Collins, Colorado where he shortly passed away. KCSU and the community remembers him and other victims of these heinous crimes on this day with the goal of letting people know they have safe places to be themselves, regardless of their sexual orientation or gender identity. The goal of this celebration is to reach a vast and diverse audience in order to represent as many unheard voices in the community as possible. KCSU hopes to elevate the spirits of this commonly underrepresented group and offer a platform to speak from their heart and have their voices be heard.